You are here: Infocentre & FAQ > Why Skye? Why is Skye so special? The magic of Skye is an ethereal quality that captures the hearts and imaginations of thousands of visitors to the island every year. It is the second most popular destination in Scotland with good reason. Words can only begin to explain the stunning scenery that changes around every corner; the light effects that are never the same twice or the unique blend of clear turquoise seas, sandy beaches and fearsome rocky mountains. To add to the attraction there is a heady mix of traditional Celtic music and art. With a history both of extreme tragedy and romance, world-renowned seafood and whisky, whales, otters and eagles there is something for everyone. 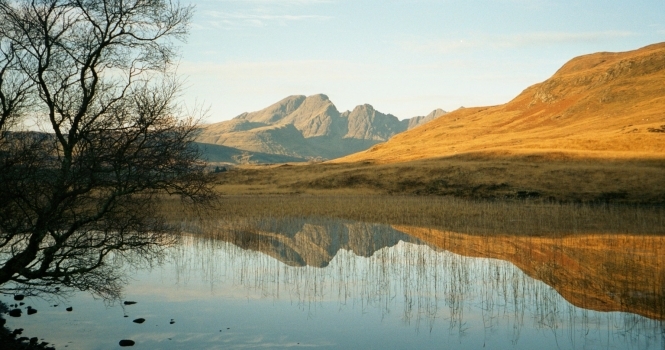 Skye is most celebrated by the lovers of wilderness. At any time of the year it is possible to find your own isolated beach, mountaintop or loch with only a small amount of imagination and effort. Pot-holing, mountain-biking, sea kayaking, scuba-diving, horse riding, paragliding and fly fishing are just some of the active pastimes available but walking remains as the biggest activity participated in by visitors. There are walks of all lengths and standards available. Short, well-constructed paths to waterfalls, beaches and viewpoints suit all members of the family. At the other end of the scale lie the world famous Black Cuillin summits, which are the only truly Alpine mountains in Great Britain. Scotland does possess the crown jewels of natural beauty in the British Isles but Skye is the Jewel in the Crown that everyone should see.